Thomas C. Pearson, MD, DPhil, is new executive director of the Emory Transplant Center, effective Jan. 15, 2013. Thomas C. Pearson, MD, DPhil, has been named executive director of the Emory Transplant Center, effective Jan. 15, 2013. Pearson currently is associate director of the Emory Transplant Center, a position he has held since the center’s founding in 2001. He is surgical director of the kidney and pancreas transplant program and Livingston Professor of Surgery in Emory University School of Medicine. He also is an affiliate scientist at Yerkes National Primate Research Center. 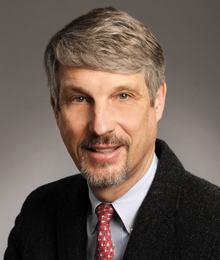 Pearson succeeds Christian P. Larsen, MD, DPhil, recently named dean of Emory University School of Medicine, vice president for Health Center Integration for the Robert W. Woodruff Health Sciences Center and chairman of the Board of Directors of The Emory Clinic. "I am so pleased to have Tom Pearson take the reins as the executive director of the Emory Transplant Center. Tom and I have been the closest of friends and collaborators for the past 25 years," says Larsen. "No one has contributed more to the Emory Transplant Center and our patients than Tom. His impact spans the strategic direction of the center, the culture of collaborative multidisciplinary care and research and the countless hours he gives day and night to patient care. I cannot imagine a more qualified physician, researcher or terrific individual to lead the Transplant Center on its future course." Pearson is associate medical director of LifeLink of Georgia, a role he has had for 12 years, and he serves on the executive committee of its board of directors. He also has served as chair of the kidney pancreas committee of the American Society of Transplantation and as the UNOS (United Network of Organ Sharing) Region 3 representative to key national committees. He currently is on the board of directors of the American Society of Transplantation and is an associate editor of the American Journal of Transplantation. Pearson's clinical specialties include islet, kidney and pancreas transplantation. Together with long-time collaborator Chris Larsen, Pearson has played a pivotal role in discovering a new class of immunosuppressive drugs known as co-stimulation blockers. Larsen and Pearson helped drive the development of the co-stimulation blocker belatacept, approved in June 2011 by the U.S. Food and Drug Administration for kidney transplant recipients — the first time a new class of drug had been approved for transplant since the 1990s. "We are extremely fortunate that Tom Pearson will assume this new role as executive director of the Emory Transplant Center," says Wright Caughman, MD, CEO of Emory’s Woodruff Health Sciences Center and executive vice president of health affairs for Emory University. "Dr. Pearson has been a long-time clinical and research leader at Emory, and he and Dr. Larsen are responsible for the Transplant Center’s international standing as one of the foremost research and clinical transplantation programs." Pearson joined the Emory faculty in 1991. He received his medical degree from Emory in 1982 and was a Livingston Surgical Research Fellow at the University of Oxford, England, where he received his doctor of philosophy in transplantation immunology in 1990. He completed a general surgery residency at Emory, where he served as chief resident, and a fellowship in transplantation surgery and in portal hypertension. He was named to Emory University’s Alpha Omega Alpha National Honor Medical Society in 2004, and he received the NIH Basic Science Award from the American Society of Transplant Physicians in 1997 and the Dean's Clinical Investigator award at Emory in 1999 and 2002.